This item comes equipped with Teal Crystal glass. This island/billiard will update your home with its eye-catching design. Featuring a bronze finish and antique bronze shade(s), this fixture will accommodate a variety of dicor styles. With its easy installation and low upkeep requirements, this island/billiard will not disappoint. This pendant will update your home with its eye-catching design. Featuring a bronze finish and clear shade(s), this fixture will accommodate a variety of dicor styles. With its easy installation and low upkeep requirements, this pendant will not disappoint. Elegant with simple yet detailed styling, the Somerset Collection 1-Light Bronze Pendant from Hampton Bay gives your home an updated and refined look. Featuring a bronze finish perfectly contrasted with a frosted white glass shade, this pendant is ideal for a kitchen, dining room or breakfast nook. Offering warm and even illumination, it looks great when installed in multiples and coordinates beautifully with other pieces from the Somerset collection for a look you will enjoy year after year. The cornerstone of the Providence Collection is quality, and this outdoor traditional pendant light is no exception. Combining a classic bronze finish and posh styling, you will find no better way to highlight the charm of your home. With the superb craftsmanship and affordable price this fixture is sure to tastefully indulge your extravagant side. 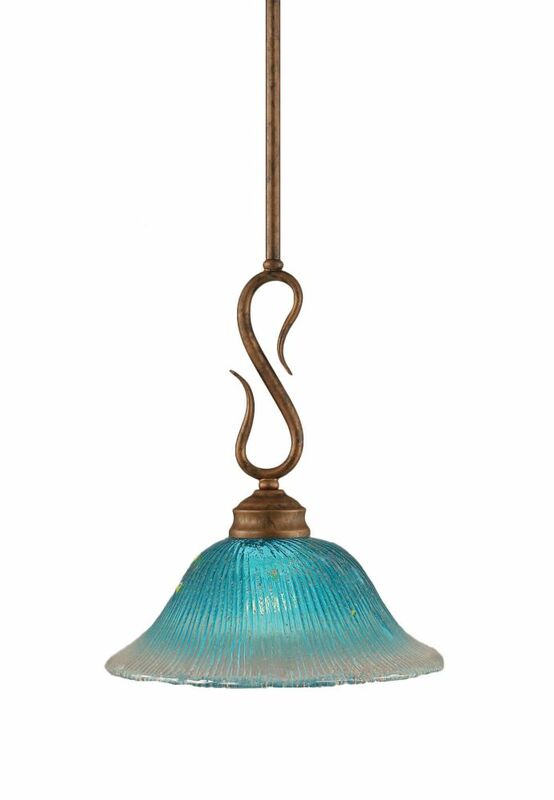 Concord 1-Light Ceiling Bronze Pendant with a Teal Crystal Glass The cornerstone of the concord Collection is quality, and this pendant is no exception. Combining a classic bronze finish and posh styling, you will find no better way to highlight the charm of your home. With the superb craftsmanship and affordable price this fixture is sure to tastefully indulge your extravagant side.